So, my daughter (almost 4) has caught the soccer bug and wants to go out in the yard and 'kick it around' all the time. Hey, that's great! The problem is, the few soccer balls I have laying around are destroyed, less than round, and were el-cheapo in the first place. A solution arrived in my inbox the other day when the good people at Soccerpro.com asked me if I'd like to review an item from their site here at TB11. I actually have a MLS mini ball that I won from the MLS Fantasy Challenge a couple years back, so I decided to have SoccerPro send out an Adidas Teamgeist II MLS competition ball. 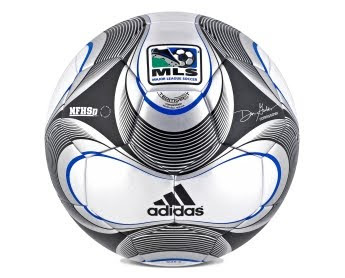 Now my daughter and I have matching MLS Adidas soccer balls to kick around the yard (one big/one small). As for reviewing the actual ball - It's great. It's been a great change for me as I've never had a premium/competition ball around the house with a seamless surface. I'm definitely a 'basic' rec player (I'm not very good is what I'm trying to say), but I honestly feel like I have much better touch and skill when using this ball compared to the bargain bin balls I've always had before. I'm really excited to take it out to the actual field and knock it around a bit (if it ever stops pouring down raining around here). All in all, it's a very nice "premium" ball that I wouldn't hesitate to recommend, especially considering the reasonable price for a FIFA approved, competition replica ball. Did I mention it has Don Garber's replica autograph, what could be better than that?